The other week we quietly added two tutorials of a new kind to the site, snuck in behind a radical site redesign. They’re instructive recipes, which anyone with a modicum of programming knowledge should be able to easily follow. 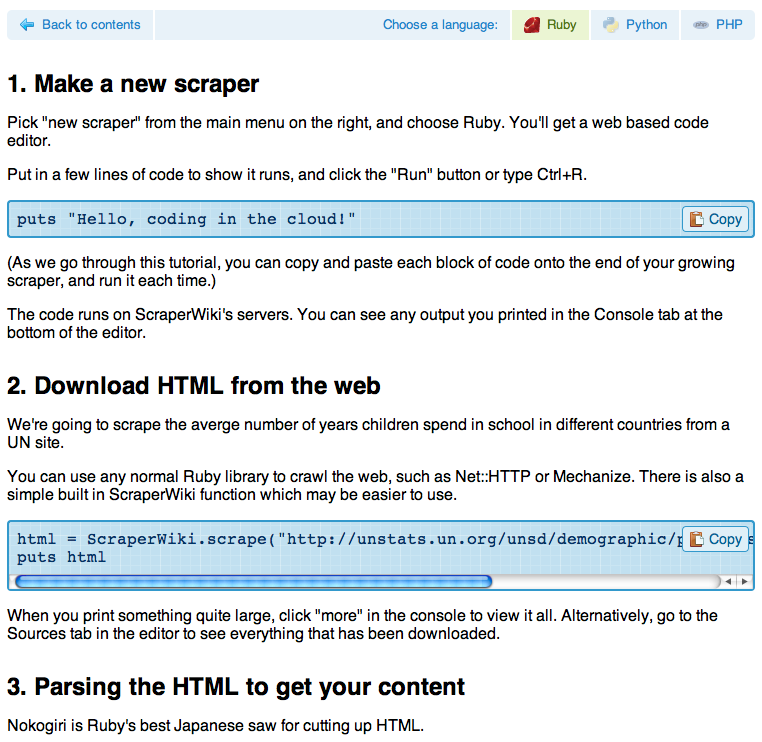 For programmers new to ScraperWiki, to a get an idea of what it does. It runs through the whole cycle of scraping a page, parsing it then outputting the data in a new form. For a simplest possible example. Available in Ruby, Python and PHP. Find out how to output data from ScraperWiki in exactly the format you want – i.e. write your own API functions on our servers. This could be a KML file, an iCal file or a small web application. This tutorial covers the basics of what a ScraperWiki View is. Hopefully these tutorials won’t take as long as Jamie Oliver’s recipes to make. Get in touch with feedback and suggestions! ← It’s SQL. In a URL.